The Midland Information, Debt, Legal and Advocacy Service Inc (MIDLAS), often hear distressing stories of hardship that exist within our community. We also hear however, inspirational and feel good stories – stories that stay with you when you go home, and those that you want to share with everyone. The following story is about Mary, a lovely lady who made an appointment to see our dedicated Disability Advocate for assistance. Mary suffers from McArdles Syndrome, which is caused by osteoporosis and muscle degeneration. She has been in a wheelchair for the past 28 years and has become totally dependent on it for her day to day life. Without her wheelchair she is very fragile and cannot walk around without the help of others. 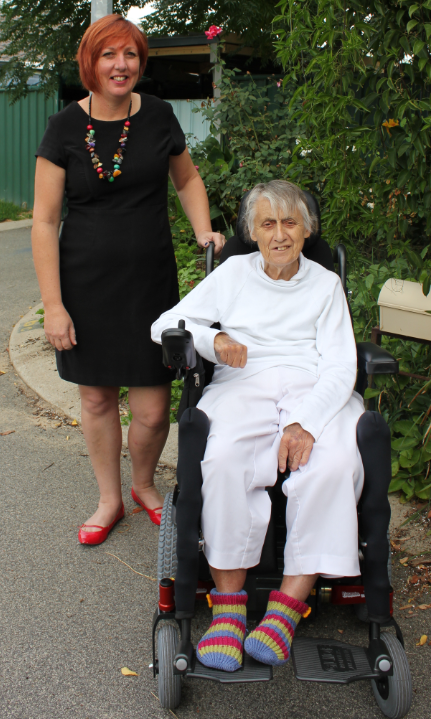 Mary recently became housebound after her wheelchair broke down when she was crossing the road. A mundane task, such as going to the Midland shops, was no longer possible for Mary. Without a reliable wheelchair she had lost her independence – and we noticed her quality of life was dramatically changed. Mary’s broken electric wheelchair was nine years old, which meant that it was nearing the end of its life. In a bid to find assistance, Mary took the wheelchair back to the hospital from which she bought it from. The hospital however, was unable to obtain the spare parts for such an old wheelchair. This meant that Mary would need to buy a new wheelchair. Mary undertook an assessment by an Independent Occupational Therapist, who recommended her for a new wheelchair that would cost more than $14,000.00! This however, was not something that Mary could afford.. As the wheelchair enabled Mary to maintain her quality of life, and independence, it was not something that she could fathom living without. With the help of the MIDLAS Disability Advocate, Mary was forced to search for alternative means of funding. The Disability Advocate at MIDLAS exhausted many avenues searching for grants to provide Mary with a new wheelchair. Mary was caught between the stringent policies of both State and Federal funding bodies, and it appeared that neither was able to assist. Mary’s current funding, which supplied her carer, did not have the capacity to provide a wheelchair. Further to this, any change in Mary’s funding structure meant that she could potentially lose her carer. Eventually, the Independent Living Centre agreed to supply a grant for Mary, but their maximum payment was $5000.00 which would leave a deficit of $9,000.00. This meant our Disability Advocate was forced back to the drawing board to source the extra $9,000.00. In the end, the Community Living and Participation Grants were able to provide the remainder of the funds, and Mary received her new wheelchair. The provision of a new wheelchair has allowed Mary to re-engage in the community. Mary is now able to leave home independently, attend her appointments, and is no longer restricted by the confines of her home. This has made a significant difference to Mary’s overall wellbeing and quality of life. If you have a similar story that you would like to share, please contact MIDLAS. MIDLAS empowers disadvantaged and vulnerable people within our community who are experiencing distress by providing them with free services and confidential information, advocacy, options, referral and support so they can achieve a better way of life. . For more information on how a Disability Advocate might be able to assist you, please contact MIDLAS on 9250 2123, or visit our website: www.midlas.org.au.